And here comes the most awaited tour plan to explore Maldives! Where sands are white as the smiles of the locals, fish swim happily in the warm waters of the Indian Ocean, the weather is a dream and the deep rays of the sun wait to engulf you in their arms. Some 1800 years ago, Arabic traders gave the Maldives a moniker that remains relevant to this day: the ‘Money Isles’. Back then, the archipelago’s abundant cowrie shells ( boli) were a powerful international currency, and these paradisaical islands have evolved into a playground for the rich and even richer. Nicknames aside, the etymology of the word ‘Maldives’ refers to the remarkable geography of this scattered archipelago. The ‘garland islands’ are indeed draped like a necklace across the Indian Ocean, hanging below the teardrop-shaped earring of Sri Lanka. And this is a treasure crafted from only the finest materials: white-gold sands with a turquoise trim, diamond-clear waters and sparkling sunsets framed by a curtain of palms. Every second spent here is a pinch-me moment. 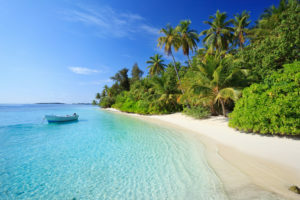 The Maldives is the world’s lowest country in terms of elevation, and therefore first in the climate change firing line, which makes its natural wonders seem all the more precious, particularly when you meet the wildlife. Keen spotters, snorkelers and scuba divers should head to the southernmost atoll, Addu (also known as Seenu), to see spinner dolphins, sea turtles, whale sharks and white terns – a striking seabird found nowhere else in the Maldives. Addu is also home to some of the islands’ most novel landmarks – a nine-hole golf course with lagoon views, one of the longest roads in the Maldives (a whole 16km, best travelled by bike) and the nation’s tallest mountain, which looms above Villingili, a staggering five metres high. 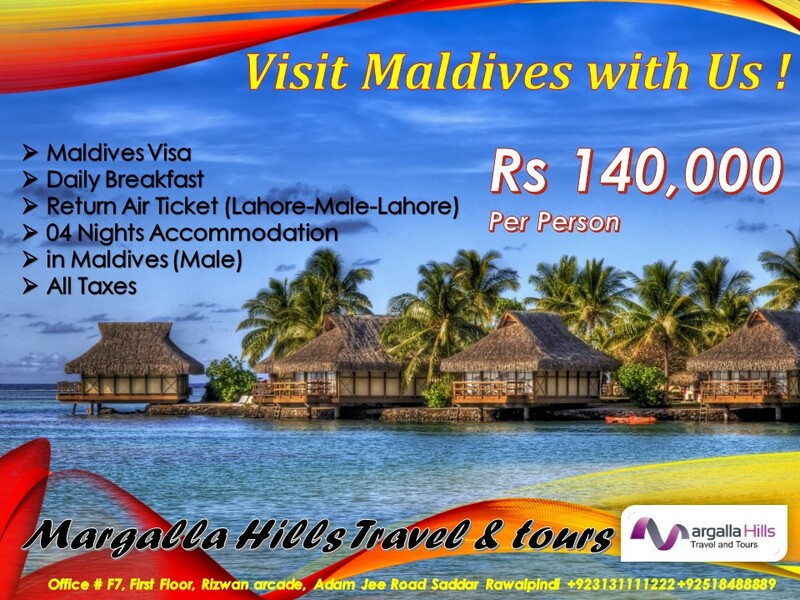 Margalla Hills Travel and Tour is offering one of the best services and Packages for Maldives from Pakistan. This unforgettable experience of Maldives Tour is arranged for you from MHTT Pakistan. Our Maldives Pacakges are unique and cheap. Call Us now at +92 51 8488889 for bookings.